Welcome Back! Today I have a bright and fun mani to show you. If you read my blog, you know that in addition to reading blogs, I love to watch Youtube Beauty videos. There is a whole Youtube Community where women (and some men) talk about everything beauty...fashion, makeup, hair, tutorials, etc. I also love to watch Day in the Life Vlogs. It's just fun watching how other people live their lives and how different, yet still the same everyone is:) One of those Youtubers I love watching is Michele1218. 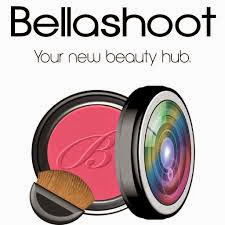 She is a very successful Youtube Beauty Guru with over 72,000 Subscribers. I have watched and commented on her videos for a few years now and have actually gotten to know her a little bit through email. I think our side conversations started by talking about the highly sought after, Essie Pink Parka and possible dupes. We posted about the dupes we have in our stashes not too long ago...hers is here and mine is here. To make a long story short, I commented on one of her recent videos about how much I loved the polish she was wearing. It was a bright bubblegum pink that looked really fun. She messaged me shortly after asking if she could send it to me because she needed another pink like she needed a hole in her head ;) I happily accepted her offer. When her package arrived, I was in shock...she ended up de-stashing and sending me a whole box of polishes! I felt like I won the lottery. Michele mentioned in her note that she reads my blog during her late-night feedings with her new baby:) Congrats Michele on baby Addie and thank you very much for reading my blog and for your generosity! I couldn't wait to try a few of the polishes she sent me, so I included two of them in this mani. Essie Boom Boom Room and Essie In The Cab-Ana. The accent nail includes polishes I received from KBShimmer (Hex Appeal ) and Zoya (Sailor). Before I get to the Essie's. I thought I'd show you a close-up and discuss KBShimmer Hex Appeal. Isn't it awesome? Hex Appeal has a navy blue jelly base with magenta, holographic silver, and blue hex glitter. I only wanted to apply one coat because I like the glitter to be more sparse, so I layered Hex Appeal over Zoya Sailor from the new Cashmere Collection. Sailor is a deep navy that is opaque in one coat, but I will review it on its own in a future post. Hex Appeal is gorgeous and I highly recommend it. It is still available on the KBShimmer website. Back to the Essie's from Michele. Boom Boom Room is from Essie's 2013 Neon Collection. While I think Boom Boom Room is pretty bright, I wouldn't consider it a true "neon". It had a pretty good formula. It wasn't the most opaque polish I have used, but it wasn't as horrible as some of the Essie polishes I have. I think two thick coats would be good enough for most, but I have some ridges and staining on my nails, so I applied three. I really do love this pink. In the Cab-Ana is from the 2013 Resort Collection. It's a beautiful blue that leans a little teal when compared to true blue polishes. In the Cab-Ana has the perfect formula. I was really impressed as it was very opaque in one coat. I applied two to even everything out, but you can totally get away with one. I thought I'd grab some other polishes in my stash for comparison sake. Sorry I wasn't able to swatch them on the nail. I know sometimes they can be pretty different on the nail vs. in the bottle. Essie Boom Boom Room looks pretty close to Zoya Shelby. I will make a note to compare them on the nails and get back to you. 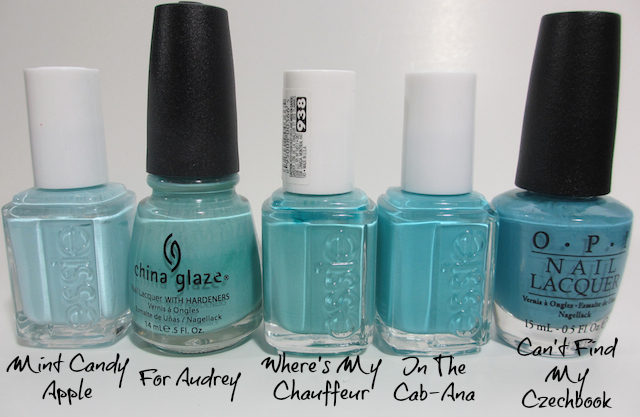 As far as In The Cab-Ana goes, I don't think I have any dupes in my collection. It's probably the closest to OPI Can't Find My Czechbook, but that is a little darker and dustier. And one more shot for grandma ;) This mani reminds me of cotton candy! Yummm. Note: KBShimmer Hex Appeal and Zoya Sailor were provided to me for my honest review. See my Disclosure Policy for more information. This skittles manicure is so cute and pretty! I love KBShimmer Hex Appeal. I had to Google Jolene. I haven't seen that one before. Yes, some of the swatches look a lot like it. But some look darker. It's a pretty color though! Yes, Hex Appeal is awesome! This is lovely! It actually reminds me of something that you could wear to a baby gender reveal party or something! It sure does! Thanks for your comment! Thanks! Yes, go check her out - you'll love her! Thank you so much for your comment:) It means a lot! Every time I visit your blog I leave NEEDING to do a skittle manicure, but I have so much stuff left to swatch- ahhhh! FWPs of a polish addict! Yes, it's hard to balance having fun with swatching. "Off to Google I go!" hehehe!! I swear, I spend half my life now on Google Images... :O maybe *I* crashed Google the other day! :O LOL! That was seriously weird though. ANYways, giiirl, do you ever have gorgeous creme skittlettes!! LOVE this! :D It seems EVERY time I've used a creme in the last few months, I get bubbles. :( I've been blaming it on the awful humidity, but uhhhm I'm fairly certain the humidity isn't that different between the northern and southern halves of our state, and your manis are pristine, so I must be committing a nail fail SOMEwhere along the line! Gorgeous skittle mani! I'm always so hesitant to do them but this makes me want to.